Forklift Training Test: Is it Important? Are you ready to complete a forklift training test? CertifyMe.net, the leader in online OSHA compliant training, is the best place to take your forklift training test! Our courses include everything a forklift operator needs to know how to operate powered industrial trucks safely. If your employees need OSHA training, CertifyMe.net has the training you need for a safer workplace. It all starts with our forklift training test, which comes before an on-hand evaluation. Here’s everything you need to know about our forklift test. Why Do I Need to Take an OSHA Forklift Test? OSHA pulls together information every year on workplace fatalities and the top causes. Powered industrial trucks, which include forklifts, are number six on their list of the top ten most frequently cited violations that lead to injuries and deaths. Forklifts may seem like standard machine equipment used for regular work, but the truth is that they can be dangerous and deadly, when not operated correctly. If you want to avoid serious accidents involving forklifts, then you need to complete a comprehensive forklift training and OSHA forklift training test before you begin work. You will drastically increase your chances of enjoying a safe and accident-free career if you do. Safety starts with your OSHA forklift training test, and CertifyMe.net also helps you prepare the smart way! Not only is forklift training highly recommended and essential to many employers, but it is also required by OSHA law. Specifically, under standard 1910.178(l), OSHA requires that employers ensure that every forklift operator is competent to operate a forklift safely, as demonstrated by the successful completion of training and a forklift training test. According to OSHA, forklift training must include formal instruction, practical training, and a forklift test evaluating the trainee’s performance. There should be a combination of visual instruction, written training and testing, computer learning, and in-person practical instruction. When you choose CertifyMe.net for the OSHA forklift training test, you will have the option of training employees as a group with one of your experienced operators as the instructors or having them go through the modules all on their own, at their own pace. With CertifyMe.net, both topics are covered in our forklift test. We make sure your employees have all the skills and knowledge necessary for a safer, more efficient workplace. Is it safe to operate a forklift with an elevated load? True or false: you only need to check a forklift’s tire pressure once per week. If you come across a safety hazard, when should you tell your safety supervisor about it? Is there ever a situation where you should use a forklift as an aerial lift? These aren’t the actual questions you’ll see on the forklift training test, but this gives you a general idea of what to expect. CertifyMe.net helps you prepare for your OSHA forklift training test, and once you’ve passed, you and your employer can print out your official certification! Also according to OSHA, workers must refresh their training at least every three years to remain OSHA-compliant, or, at the time of an accident involving a forklift, a near-miss accident, the operator doing unsafe actions, the type of forklift changes, and the environment changes. What is the Forklift Training Test Like? 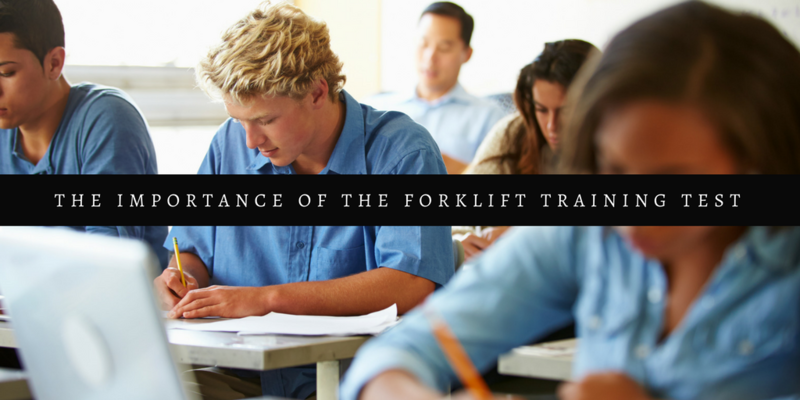 The forklift training test may sound intimidating, but it doesn’t have to be. When you choose CertifyMe.net, you’ll be investing in an online program that covers all OSHA forklift training test requirements and only takes about one hour to complete. The course is self-paced so you can take as long as you need to complete the test, and you can also take it multiple times. Once you’ve completing the online portion, you’ll be ready to take the practical assessment. For only $59.95 per forklift training module, you’ll be ready for your career as a forklift operator at a fraction of the price of other training systems. An in-person skills evaluation that tests the trainee’s ability to drive a forklift safely in a work area similar to the future workplace. The evaluation goes over different start and stop mechanisms, completing the steps of the pre-start inspection, and operating the forklift in different situations, like backing up, moving forward, turning, navigating turns and blind spots, and driving on slopes. Once the written tests and evaluation has been passed successfully, the trainee will be able to print their operator card and begin work. They will be officially certified for work and compliant with OSHA regulations. With CertifyMe.net, we make it easy, fast, and convenient to complete forklift training and for workers to take their OSHA forklift training test. Depending on how your employer has set up the training, you may complete it at work with a group of other employees, or at your home from a device with an internet connection. The forklift certification courses from CertifyMe.net cover all of the components and training topics as mentioned above, to ensure all workers are 100% OSHA-compliant and fully prepared to pass the forklift training test and operate forklifts safely. When you purchase the training kit with us, you will receive all necessary handouts, checklists, and study guides, and will forever receive free three-year renewal training to meet OSHA requirements. You want to know about forklift training test questions and answers. CertifyMe.net gives you a complete OSHA forklift training experience, thanks to our proven 5-step process. So what are you waiting for? Completing your forklift training test with CertifyMe.net is a no-brainer. Sign up today, and you can protect your safety and qualify for new, higher paying jobs in as little as one afternoon! Our forklift certification test is ideal for employers and employees – and it’s also the law! CertifyMe.net will help you prepare for your forklift training test, and we’re also your training partner throughout your entire career – we also offer free renewal training! Thanks for visiting CertifyMe.net!